Yesterday was a tough day. Sorry no blogs, it has been very busy as we have gone through three countries to get from Cochem on the Moselle to Richardmenil on Canal des Vosges. Yesterday when we arrived at the Liverdun lock (on the Moselle) at 8.30, we found a large 110 metre barge sitting waiting to go through. It turned out he was very important to us. Nuala rang the lock keeper as there was no sign of the gates opening. 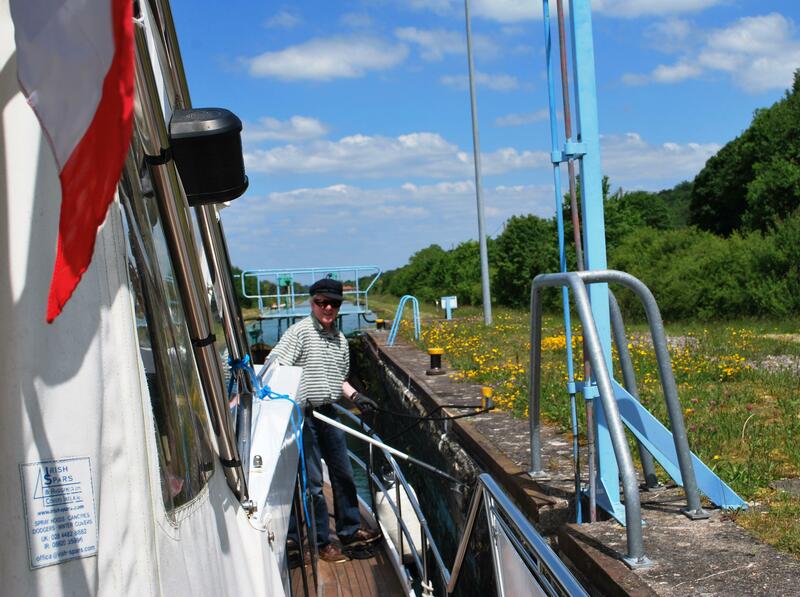 He firstly told Nuala that the locks did not open until 9 am (a big shock to us as having spent the last four months on highly used large commercial waterways of Germany and France where locks are open 23 hours a day, we had forgotten the restricted hours and more leisurely pace on small less commercial waterways). The lock keeper was equally surprised to hear that there was a barge sitting outside the lock. 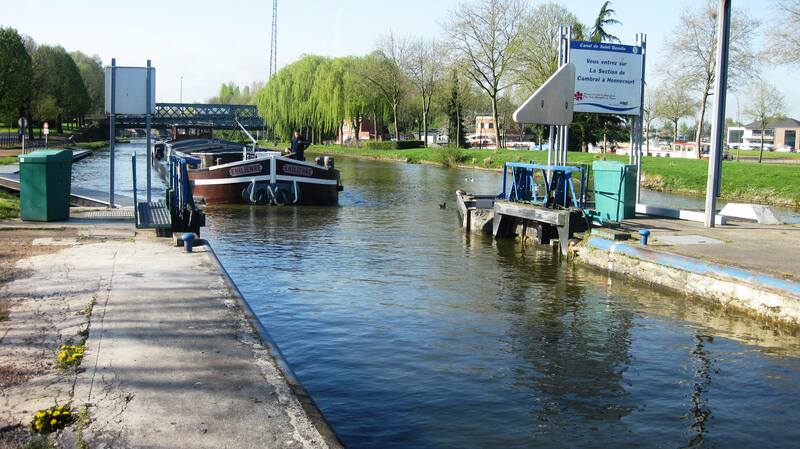 He said that because of a sports day on the canal, that the system was due to be shut during the day (this is France). The lock keeper arrived post haste and we were both let into the lock behind the barge and so it was for the next six locks. We think that at the second last lock, at Toul lock, the sports event had to be suspended for one hour to let us through. So without the barge we would not have got through that day- this turned out to be even more important. In Liverdun, the lock keeper came down all the way from the control room to have a chat with us and I recognised that we had met him before and that he regularly visits Ireland. Nuala gave him a gift of an Irish key ring (she keeps a supply for giving out) and told him we were going down the Canal des Vosges and asked if was all ok and the system open. He said he did not know and the conversation finished as the lock was full and the Captain of the large barge was keen to leave. 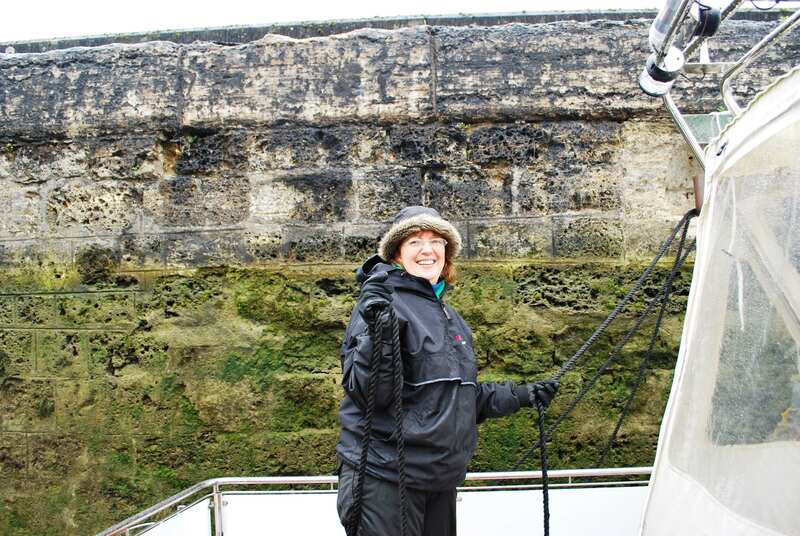 When we got to the next lock in the lashing of rain, the lock keeper came down to tell us that there was a problem with the Canal des Vosges and that it would be shut for the rest of the year (in two days’ time). He emphasised that we might not make it and that we must go as fast as we could. If we did not get through the Canal des Vosges then we could not get to Chalon where the boat is booked into for the winter. We think that the lock keeper in the first lock, after talking to us, went to check on the situation and found that the canal was closing. He then rang the next keeper and asked him to tell us. When we got to the third lock the keeper also came rushing down and told me to hurry up and follow the barge quickly into the lock. If we had not met the barge and got through the supposed to be shut locks, we would have lost a day. If we had been a day later we would not have got onto the Canal des Vosges, before they closed. If we had not met and given the present to the friendly lock keeper, we would not have known the system was due to be shut. Now we have a number of VNF staff minding us, knowing where we are trying to get to….Now that is what you call the luck of the Irish! 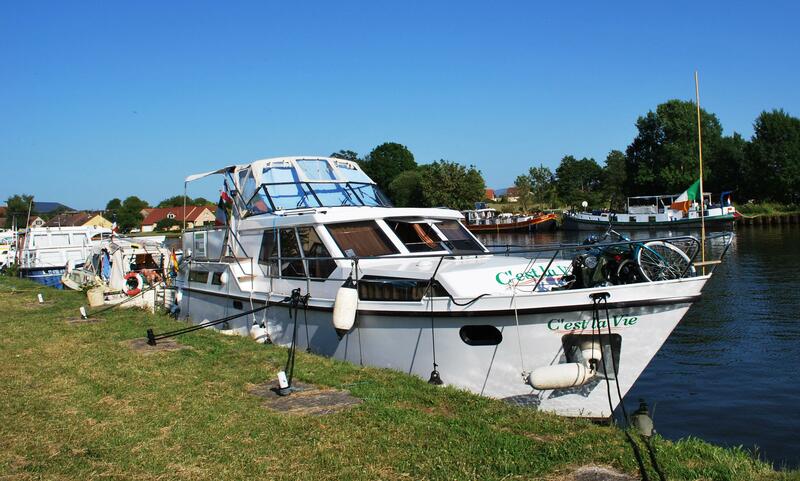 This entry was posted in C'est La Vie - The Boat, Experiences on the Canals, front page, On the Journey, Places visited and tagged Canal de Vosges, Chalon, Chalon sur Saone, Cochem on the Moselle, Liverdun lock, Richardmenil on Canal des Vosges, Toul lock. Bookmark the permalink. 4 Responses to The luck of the Irish- How a key ring saved our plans to get to winter mooring in Chalon sur Saone. What a wonderful story, I think the best yet.